Salted Chocolate Peanut Butter Tart. And Self-Care! Self-care and peanut butter. Strength and peanut butter. Real life and peanut chocolate tarts. Crying babies, full time work loads, and peanut butter. These combinations might just strike you as odd pairings, but I’m sorry, sometimes nothing heals the soul like a touch of chocolate, a good ol’ cleansing cry, and prayer. We have a beautiful family, a family we have fought hard for. We have children that took years to conceive, and each took a year out of my life in the form of bed rest to get here. Let me first start out by shouting from the rooftops that Jesus is a healer. He is faithful. Even when life is the very hardest He is a God who is mighty and wants a relationship with YOU. This last summer, after a grueling year of medical difficulty, I was able to welcome our baby boy, Milo Wilder Ellis, into the world, two months premature via emergency surgery. I had a few false labor scares and hemorrhaged throughout the majority of my pregnancy. This period of time for us was rocky, to say the least. It’s taken me nine full months to be able to fully talk about his birth and what a miracle he is and how much he blesses everyone he comes into contact with. Milo means “merciful.” I can remember coming out of anesthesia, unable to open my eyes, and shouting through tears, “His name is Milo!” My family tells me that each person in the room –- doctors and nurses included -- was in tears right along with us. When I go through something traumatic, it takes me quite a while to process it. I generally cry and tuck the trauma away for fear of weakness. Then, without warning, that touch of trauma comes out in subtle ways as if to say, “Hey, remember this? Are you ready to work through it now?” Often times I say, “Nah, not ready.” Then sometimes Jesus loves me so much he allows a breaking point, and that bit of hurt comes back and I’m ready for healing. Somehow each night, while I couldn’t sleep, I sat awake in my bed or curled up on my couch and wrote. I wrote and wrote and cried and wrote some more. God used that book to get me putting one foot in front of the other and tackling each day one by one, and somehow by October we had a book that felt like a dream. We had our baby home and I was healing physically, and come December it was time to send the book out and journey forward. We’ve been on a whirlwind of a book tour and career amp-up with television appearances added to the agenda frequently, and I feel so overwhelmed by God’s grace and provision. This last month or so, I’ve felt a heaviness. Milo has had a few health complications, and during this time I was beginning to think about his birth story. Man, why was just thinking about it hard? Why was I still emotional at the thought of everything? Why was what we were going through feeling like it was unraveling me? I’ve been pressing into the Lord for healing. Having a baby without a complication is life changing enough: your hormones are crazy, you feel happy and sad and filled with hope, and sometimes it’s dark. Throw in a couple complications, and "life changing" doesn't begin to describe it. For some mothers, after baby is a wild tough ride to finding their way back to good. I’m a head-down-let’s-just-move-through-it gal, and when it comes up just try to kinda talk about it, but nope -- not too deep. I’m strong, remember? This last month, I’ve been relying on God for hope and to find my joy. On Friday evening, I went to dinner with two very special girlfriends. You know the ones, the unconditional kind. I had back-to-back shoots all day, it was hot out, and I was a mess. Traffic kept me from getting home to shower and change into my girl’s night clothes, but that’s quite alright because these are the girls that don’t care if you’ve got no makeup on, dirty hair, if you are emotionally fragile, and they are there to lift you up, to cry right along with you, and ease you through the tough stuff. I woke up on Saturday, and I felt like I had some pep back. It took me nine months to share about some of these things, but it feels so good. Motherhood is hard and beautiful. That feeling like you are doing it all wrong and the fear that may come along with that are okay, just fine. You are okay. It’s normal to be sad and to work through it. Just don’t move in there. I’m not a wallower, but I’m learning how to care for myself in a way that’s healthy. The sun in western Washington is beginning to peek through, and each day, even during the heavy times, feels like a gift. I’m grateful for every valley because these valleys draw me to Jesus. They peel back layers and they reveal a better version of me, a version that’s kinder to herself and more loving towards others and their struggles. We can’t heal if we stuff it all away. We can’t heal if we just keep saying, “I can’t – WON’T ALLOW MYSELF TO -- feel this way! It’s not me!” But what if we just took a deep breath and admitted it? Then we could look up finally. Man, making people is hard, right? They are almost literally your heart walking around outside your body. I’m here to tell you that you are strong and brave for what you’ve walked through, and you are a beautiful. So, whatever your story, whatever it is you’ve gone through, however harsh the turmoil you may be working overtime to avoid confronting, I’m hoping you engage in a little self-care. Exhale, forgive yourself, and move through it. Maybe binge watch The Office on Netflix and laugh at your own shortcomings. Maybe, to bring this all around to something extremely delicious, indulge in this peanut butter & chocolate tart! You’ve got this. For now, I’m gonna snuggle the babies I’ve got and revel in the fact that Noah is the funniest six year-old alive and Milo has three – three! -- teeth and ate a soft bowl of noodles today. This life is good. We are okay. Better than that, even. 1) To make the crust, preheat your oven to 350 degrees. 2) Blitz graham crackers, cocoa butter, and sugar in the bowl of your food processor until a fine and crumbly crust comes together. If you don’t have a food processor, crush the mixture in a Ziploc bag using the bottom of a drinking glass or a rolling pin. 3) Press mixture into the bottom of a 9- or 10-inch tart pan with removable bottom. If you don’t have a tart pan a pie dish works just fine. Bake for 10 minutes. Remove when done and cool crust slightly. 4) For the filling, mix peanut butter and sugar into the condensed milk and egg yolks. Once smooth, add the heavy cream, salt, and vanilla. Mix until smooth. 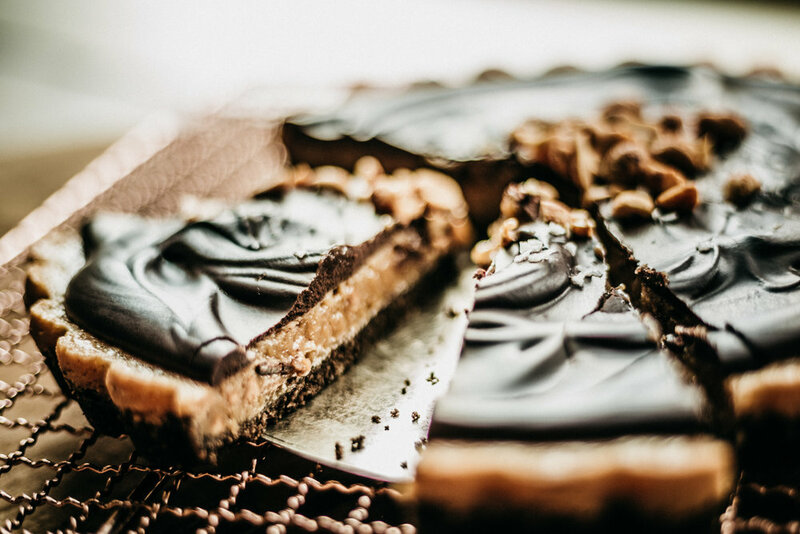 Tip: before you pour your prepared peanut butter filling into your tart pan or pie dish spray a touch of non-stick cooking spray along the inner rim of the prepared crust. This prevents the filling from sticking to the sides of the pan when it’s finished baking. 5) Pour the filling into the baked crust and bake for 15-18 minutes. The center should have a slight wobble still. This tart is finished before it looks completely done. 6) Allow pie to cool completely before adding chocolate and chopped peanuts and salt. 7) Melt chocolate and heavy cream in 30 second blitzes in the microwave, then add the cream and mix until smooth. 8) Pour the chocolate over the cooled tart and sprinkle with chopped salted peanuts, and sprinkle with flakey sea salt.